Canon’s cheque scanners come with software drivers to boost your scanning power. Customised to a wide range of leading cheque processing software or easily integrated into existing systems for the widest cheque scanning options available.For businesses or organisations that scan cheques frequently or professionally, accuracy and reliability are crucial. Canon’s cheque scanners are designed with smart features, and are easy to use from front-desk counter to back-end desk. Available in compact front-counter sizes and designs, Canon’s cheque scanners are built to fit even in the narrowest of spaces. With duplex scanning and up to six types of scanning modes, the only thing small about it is its size. Multiple feeds – from mixed sizes to odd-sized cheques – are supported with extended trays and an advanced paper handling mechanism. Canon technology further protects against lost data due to multiple feeds, so you never have to perform the same task twice. 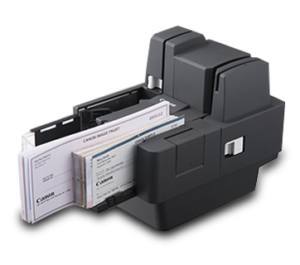 All Canon’s cheque scanners feature a built-in imprinter, which prints endorsement information on cheques of up to 48 characters before being scanned by the image sensor. This allows routing details and other information to be included in the cheque’s image. These scanners boast a convenient cover that opens to the side, making clearing mis-feeds, paper jams or performing maintenance tasks such as cleaning the scanning glass or feed rollers easier and more effective.